Christmas Tags – Don’t Throw ‘Em Away! What do you do with all of your Christmas tags? We like to use ours! ONE: Melt 8 oz clear melt and pour soap base. 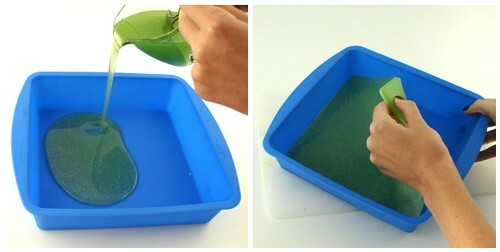 For a fun lime green color, add 4 drops of Liquid Green and 1 mini scoop of Yellow Mica and mix well. Then, for an extra special touch, add 3 scoops of iridescent glitter. TWO: Once the colors are fully mixed in, add your favorite Christmas fragrance oil. We chose Kumquat. What? You don’t get kumquats in your stocking? THREE: Pour the soap into a brownie pan mold and let cool (approximately 20-30 minutes). FOUR: Remove the cooled soap from the mold and place on a cutting board. 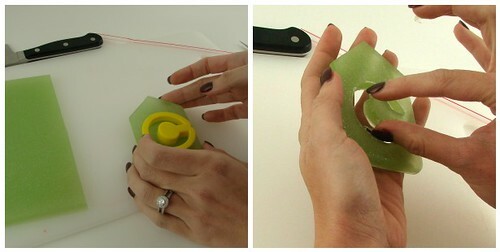 FIVE: You can use a cookie cutter or use your craft knife to cut out Christmas tag shape. Get creative and remember they don’t have to be perfect. Once you have your Christmas tag, cut out a letter or object in the middle either by hand or with a cookie cutter. Depending on the size, you should be able to get 6-8 tags out of one sheet. SIX: For an authentic Christmas tag detail, use a straw to cut out a hole at the top for the ribbon. Use your finger to smooth out the edges of the soap. Tip: If you decide to use a cookie cutter, just smooth out the edges of the soap with your finger when you’re done. My cookie cutters didn’t leave me with the smoothest edges. Yours might be better than mine. SEVEN: Melt 3 ounces of clear melt and pour and add 3 mini scoops of Red Blue Mica and 1 mini scoop of Merlot Mica. This is my favorite combination for an awesome hot pink color. We’ll be using this color to fill in our letters. 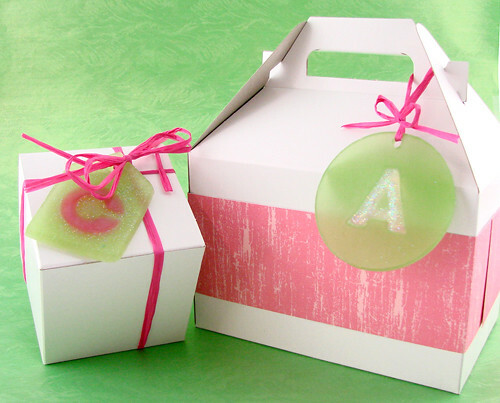 EIGHT: On a flat surface, place your soap on top of your smoothed out freezer paper or saran wrap. Firmly press the soap so that it sticks to the freezer paper. We’ll be pouring soap into the center and we don’t want it to leak. 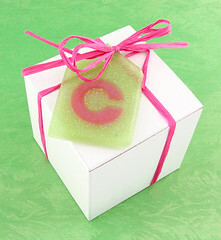 NINE: Spritz the green soap with rubbing alcohol and fill in the hole with the hot pink soap. Spritz again with alcohol to get rid of any air bubbles. If you go outside the lines don’t panic, just use a scraper tool to scrape off the soap once it has hardened. I can't wait to try…. sometime in the hours of 1-3 am. These look so great on the gifts! Easy to see under the tree and we won't be throwing away all those little paper scraps. Thanks! Really, really brilliant! 🙂 Thank you! creative! i didn't think you could leave MP soap out like that but I suppose it works! I love this! Can't wait to try this. That is really clever! I am going to have to try that. Does this mean we get two tutorials this week? I thought Debbie was doing one tomorrow. This is so neat! I love the freezer paper idea! how cute! i was just thinking about doing soap christmas ornaments but maybe i'll do this instead! Oooooh, what a great idea! !